It's in the weekly ad. Credit to a thread on GameFAQs. I couldn't see the ad very well. I'll update the title, thanks. Nice, have one store near my work so I'll stop in this week! Wow in not sure where one is around me. If I find one, I'm in for a $50 card for $40! Thanks for the post, keyblader! Definitely gonna pick up $80 worth of eShop credit to get Hyrule Warriors 3DS and Bravely Second! Hadn't even heard of this store; turns out there's one by my mom's house. Time to pay the store a visit tomorrow. There is literally one of these within walking distance of my house. I'll definitely have to check this out by the end of the week! You see, he's had a bad relationship with his mother after the dollar store incident of 2014 and forgot about all of dollar stores around her home until now, when it matters the most. I wonder if they have those $50 for $45 packs? You know it IS possible that his mom just moved to somewhere new. Not everyone lives in the same place all of their life. If I recall correctly, they usually have a coupon on the back of their receipts for like $5 off $25. Could try buying something small first, then using the coupon on the receipt. It's not likely to work with gift cards, but it's worth a shot. I think we've got one (LOL, just checked their site, and we have 5). If it's where I think it is, it's just a few minutes away, with a plasma donation place attached to the side. It's such a sketchy-looking establishment. This could go swimmingly with the Xbox Spring Sale though, if they bother to have a decent deal or two during it. 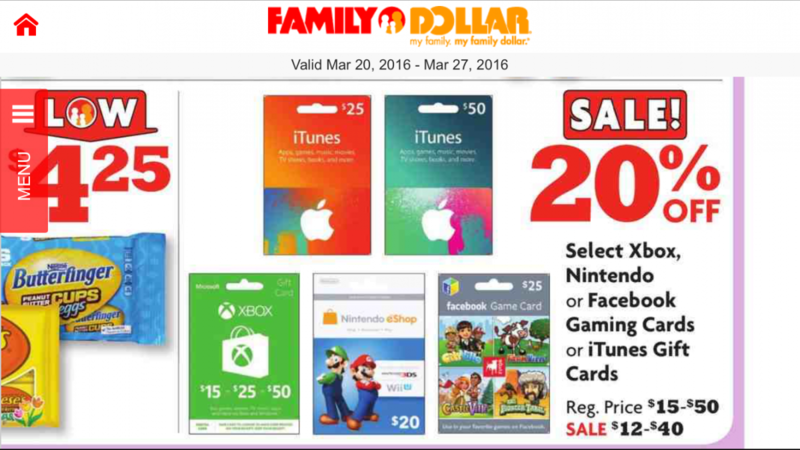 Dollar General does, but maybe Family Dollar does, too. Don't think I've shopped in one for 15 years or so. Time to head back! Maybe I'll get some tomorrow. There was a family dollar next to the grocery store i used when i lived at my previous house. I went in there once to buy a dry erase board. It was, in truth, a filthy junk store. But i remembered that i needed the board as i was walking to my car from the grocery store so i went in. Was never there, but i was assuming everything in there would cost like a dollar, which ended up being completely incorrect. Got the dry erase board, it was like 4 dollars. About 2 weeks later the magnetic strips on the back that hold it on the fridge fell off and the black marker wrote in a faint gray at best. So....yeah. thats my family dollar story. Im thinking of selling the movie rights. If it's where I think it is, it's just a few minutes away, with a plasma donation place attached to the side. It's such a sketchy-looking establishment. Xbox Spring sale coming up, this might work out since it's not B1 G1 20% off, it's 20% off any of them. Never thought I'd see the day. ....Gamers going to Family Dollar for a deal. FD=Family Dollar. Start educating the masses. You must be new to this site. Veteran CAGs have gone to Rite-Aid and Dollar General for gift card deals before.